Sports Desk: Incessant rain has washed out first day of second New Zealand-Bangladesh Test in Wellington. 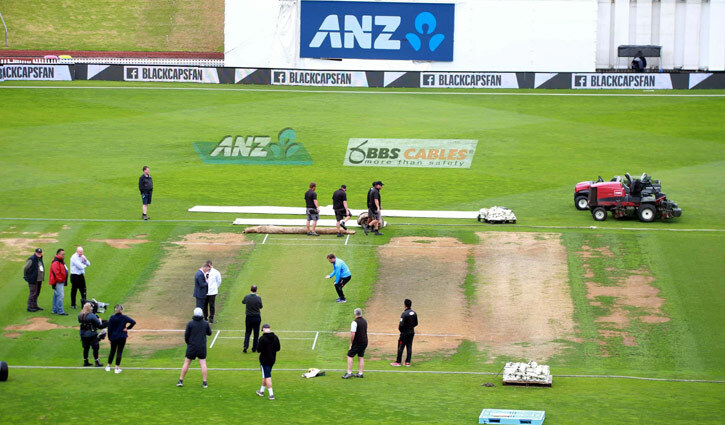 Earlier on Friday, heavy rain washed out all of the first day's play in Wellington. The umpires called off play at 3:09 pm local time - roughly half an hour before the scheduled tea break. None of the players from either side turned up at the ground, though a few members of the backroom staff, including Bangladesh coach Steve Rhodes, did. Play will begin half an hour early on day two, at 10.30 am. The forecast, however, remains gloomy, with rain predicted at least until mid-day on Saturday, after which the chances of showers abate slightly. The rest of the Test match, which carries on until Tuesday, is also likely to be hampered by rain breaks. One bit of good news is the drainage situation at Basin Reserve. Although there was heavy rain, the water seemed to seep out of the outfield quite easily, with only a slight residue of rainwater left on the surface. New Zealand are sitting on a 1-0 lead in the series, having blown Bangladesh away by an innings and 52 runs in Hamilton. The visitors had some good performances with the bat, but their rookie pace attack was outclassed by New Zealand's experienced trio of Trent Boult, Tim Southee and Neil Wagner. Bangladesh lost their last Test in Wellington two years ago despite posting a first-innings total of 595, with Shakib Al Hasan scoring 217 and Mushfiqur Rahim 159.